Located in the coveted Dana Hills, this four bedroom plus den/office home sits on a fantastic lot at the end of a quiet cul-de-sac. The dramatic entry and grand staircase are a focal point of this lovely home. The spacious floor plan features a formal living room with vaulted ceilings, dining room with view of the expansive side yard, and a family room with cozy fireplace. The kitchen features plenty of cabinet space, granite tile counter tops, and a charming view of the back yard. The first floor also has a den/office with custom built-ins. The second floor hosts four bedrooms. The master suite features vaulted ceilings, a large walk-in-closet, and a delightful balcony perfect for relaxing. 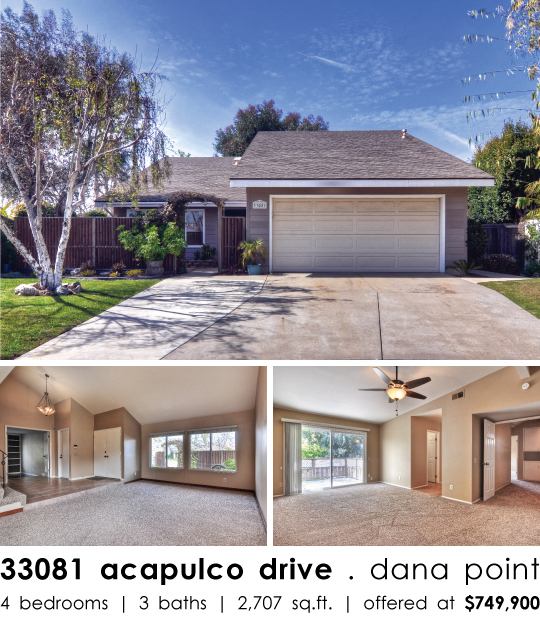 The home features new carpet, upgraded windows and sliding doors throughout. The large grassy side yard is perfect for outdoor activities and entertaining. Conveniently located near Dana Hills High School, the Dana Point Harbor, and some of South Orange County’s best beaches and attractions.